In a few months he would graduate from UNC as a biology major and be drafted in the fourth round in the NBA by the New Jersey Nets. Yet like flowers that bloom in the springtime, senior Steve Hale had a budding idea. The next phase was medical school, something he began thinking about his junior year after enjoying some anatomy and physiology classes. Turning down a chance to play professionally, especially in the NBA, is a foreign concept in American society. But the 6'3" combo guard was an anomaly, even at UNC, where 10 of his former teammates played in the NBA. Unlike many of his fellow Tar Heels, Hale disliked the amount of travel an NBA player must endure and believed his time in the league would be short-lived. His achievements under coach Dean Smith suggested the contrary to his own beliefs. In Hale’s four years, UNC marched to the sweet sixteen and elite eight twice, while winning three regular season ACC titles. He was co-captain with Brad Daugherty his senior year, 1986, in which the team ranked number one nationally virtually all year. Among fellow Tar Heels, Hale ranks eighth all-time in assists (503) and eleventh in steals (164) and free-throw percentage (.813). However, for the people who knew Hale closely, choosing medical school over professional basketball was not a surprise. In the Hale family, there was more to life than basketball. Nevertheless, when Hale did not have a book open, he was on the basketball court. As a coach’s son, Hale began playing basketball at age 3. His father, Jerry, coached at the College of Southern Idaho until Steve was 10 and then took the helm at Oral Roberts University, moving to rural Jenks, Okla. Unlike his older brother and sister, who had other interests, Hale loved being around Jerry’s teams, attending virtually every practice from the ages of 5 to 13. “I used to come home from school and go right to practice,” Steve said. “They had practice at about 3 o ’clock so it was like a babysitter. I used to go to and watch every practice and in between drills I’d shoot or play. And then as he got ready after practice I’d shoot and play with some of the guys. So about three hours a day I’d be at the gym at practice. I loved it.” Daily attendance rubbed off on Steve as he saw Jerry reward those players who exhibited extra effort despite having less talent. Hale ’s high school coach, Joe Holladay, had a similar philosophy to Jerry. Hale was never frowned upon and his extraordinary hustle and mental toughness began to separate him from his peers. Always in superb shape, Hale ran from his house down the road and back, a two and a quarter mile distance. He ran it faster each time, even in the over 100-degree summertime heat. His dedication soon paid off. Recruiting letters started arriving his sophomore year of high school, mostly from Midwest colleges. Never playing in AAU tournaments or all-star games, Hale did not get national exposure until the summer before his senior year. He attended Howard Garfinkel’s prestigious Five -Star Basketball Camp in Pittsburgh. Hale knew there were hoards of college coaches at the camp and somehow he had to distinguish himself from the other 300 players. At the time, he did not know UNC assistant coach Eddie Fogler was watching. In one of the first outside scrimmages, the player he was guarding lost his dribble for a moment and Hale dove on the concrete after the ball – a trademark for the rest of his playing career. Fogler was so impressed, he went back and told the rest of the coaching staff about a player who was diving on concrete. UNC recruited Hale his senior year, along with Duke, Arkansas and all the Big Eight schools. He enjoyed his to Chapel Hill most, noting the cordial welcome the players gave him. He also wanted to compete for a national championship each year. Holladay’s coaching style was similar to Smith’s. Holladay utilized every minute of practice time with a purpose, ran an up-tempo offense and let Hale play point guard despite being taller than most of his teammates. He appeared in all 36 games his freshman season. A devout Christian, Hale joined the Fellowship of Christian Athletes at UNC, a group he had participated with since high school. Teammate Matt Doherty took him to an FCA meeting shortly after arriving in Chapel Hill and introduced him to Lyn Taylor, who he would start dating a year and a half later and marry soon after graduation in May 1986. He soon developed his niche of basketball, academics and religion. Although he was soft-spoken and humble off the court, his teammates and coaches commended his combination of competitiveness, basketball IQ and fundamentals. Every preseason the players were timed in a mile run and every season Hale led the pack. In fact, he ran a 4:39 mile that was a team record for years. Nevertheless, Hale says his athletic ability was his biggest weakness as a player. Maybe his size 14 sneakers slowed him down, but his teammates would tell you the contrary. Teammate Michael Jordan was quoted in several publications saying Hale was one of the toughest defenders he ever faced. Hale said that he learned players’ tendencies every day in practice and gained his mental toughness from playing one-on -one with his older brother Mike, who was less talented than Steve but refused to be beat. Coach Smith also noticed Hale’s effort and inserted him at the starting point guard position his sophomore year when freshman Kenny Smith was out for a few weeks with a broken wrist. Hale started alongside Smith his junior and senior year. Hale and Smith gelled together and made coach Smith’s job easier because they both could play the point or shooting guard position. Their similar style of play showed up on the stat sheet, posting similar numbers in all categories. 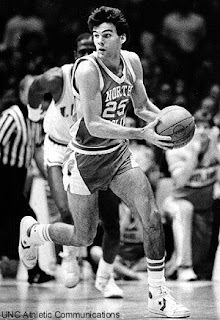 They also were two of the first five UNC players to play in the newly built Dean Smith Center on Jan. 18, 1986 – a date Hale delivered one of his best offensive games. His career-high 28 points on 10-for-12 shooting helped the No. 1-ranked Tar Heels edge No. 3-ranked Duke 95-92. Still, he downplays his performance. Hale continued to play like he had at the Five-Star Camp despite his individual and team success. Perhaps the greatest testament to his character came during one of his last games as a Tar Heel, facing Maryland at home. Matched up against All-American Len Bias at the top of the key, there was a loose ball. Bias took two or three steps and reached down for the ball. Hale dove for the ball and his chest landed on Bias’s knee. Hale left the game and came back in after what ended up being a collapsed right lung. He missed his last three regular season games, yet came back at full strength in the ACC tournament. 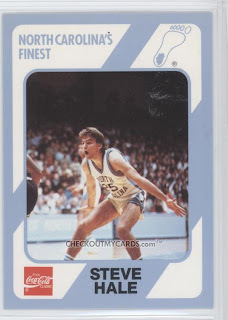 His sacrifice on and off the court was recognized as he was twice selected UNC’s best defender and most inspirational player and was one of 10 players nationally on the GTE Academic All-American Team in 1986. In September of 1986, Steve and Lyn had a year-long honeymoon in England before Steve began medical school at UNC. He played professionally during that year, but it was low-key and a relaxing time for them, before planning their future. After medical school, they decided he might want to try his residency somewhere in New England, and if it did not work they could always come back to North Carolina. Hale got matched with his first choice in the Burlington, Vt. area, where he has practiced pediatrics ever since. He said he enjoys spending time with his family, even when he’s on call, and takes advantage of Vermont’s wilderness, going hiking and camping. Last summer he did some backpacking on the long trail -- a remote path far away from the world of the NBA --living a life by his beliefs. Brett Garamella is a junior journalism and political science major at UNC-Chapel Hill. He is an avid sports fan, in particular basketball and golf. This past summer he wrote for the Burlington Free Press in Vermont. This story first appeared at TarHeelDaily.com in January 2003.